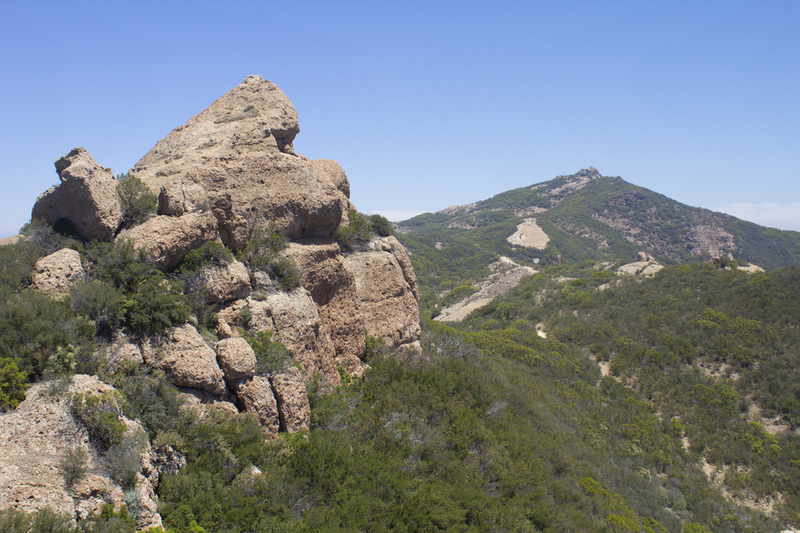 This loop hike to the top of the Santa Monica Mountains' highest summit, Sandstone Peak, incorporates both the Mishe Mokwa Trail and sections of the Backbone trail for a 6.25 mile trek through three distinct environments and interesting sandstone formations. 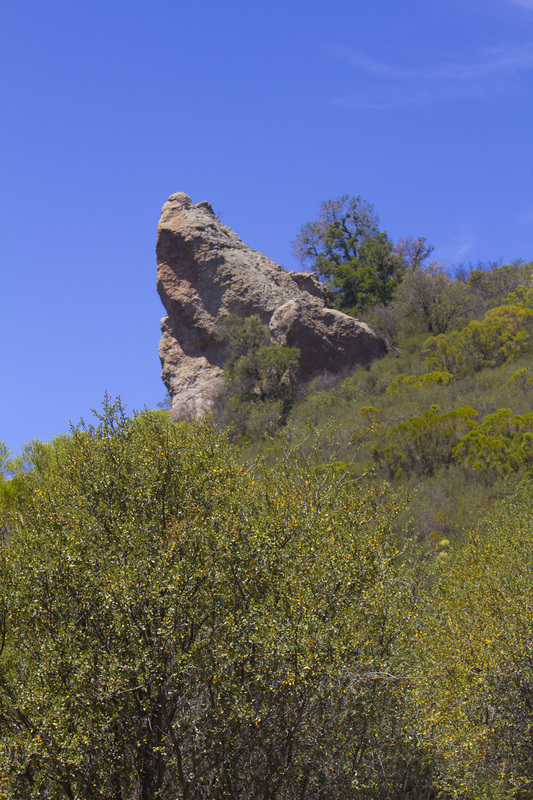 From the parking area, hikers pass through a towering forest of coastal chaparral in the canyon east of Sandstone Peak and past the gravity defying Balance Rock. The rock is a massive triangular boulder perched precariously on a promontory on the opposite side of the canyon. The trail begins with a moderately steep ascent, but levels off into a fairly easy stroll as it winds it through the canyon. 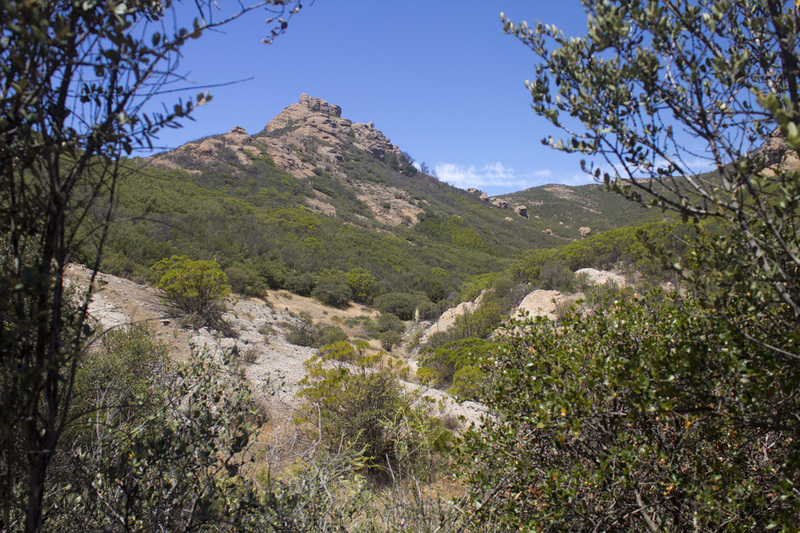 As the Mishe Mokwa section of the hike approaches the Split Rock Picnic Area, the trail descends briefly through a lush riparian landscape that more closely resembles an eastern forest than southern California scrub. Upon exiting the picnic area, hiker's again begin to ascend on a gradual incline around the north side of Sandstone Peak toward Tri Peaks. Along the way are interesting outcroppings of sandstone that, to the creative eye, take on some interesting shapes, such as the Howling Wolf and the Curious Man, a cliff face that seems to show a man with his head cocked toward the trail. 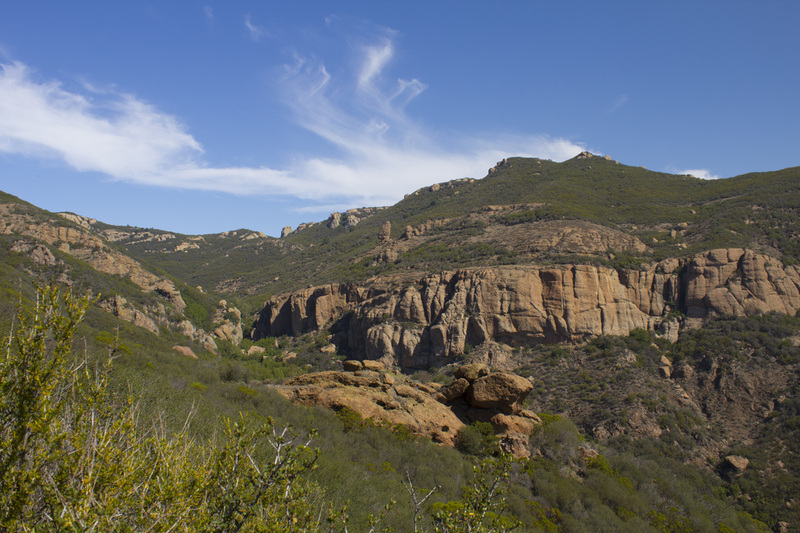 As the trail rounds the western slope of Sandstone Peak at Tri Peaks, the landscape changes once again to the more typical semi-arrid and open rocky hills of southern California. 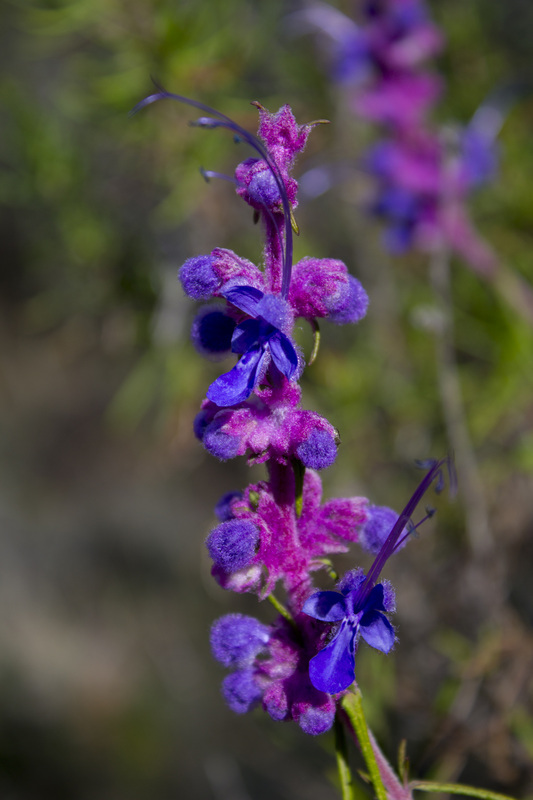 Reconnecting with the Backbone Trail, the hike from Tri Peaks to the summit of Sandstone features several impressive overlooks and sweeping vistas across the canyons from the Pacific Ocean in the south all the way to the Sierra Madre Mountains in the north. The 360° views from the pinnacle of Sandstone Peak are nothing short of stunning. The trail descends sharply from Sandstone Peak back to the parking area, losing the nearly 1,100' of elevation you gained in 4.75 miles in just 1.5 miles. The trail is mostly easy to moderate, but there are a few challenging ascents, including the spur trail to the summit. These heart-pumping climbs, though relatively short, combined with the steep descent and length of the hike rate this trail as strenuous. 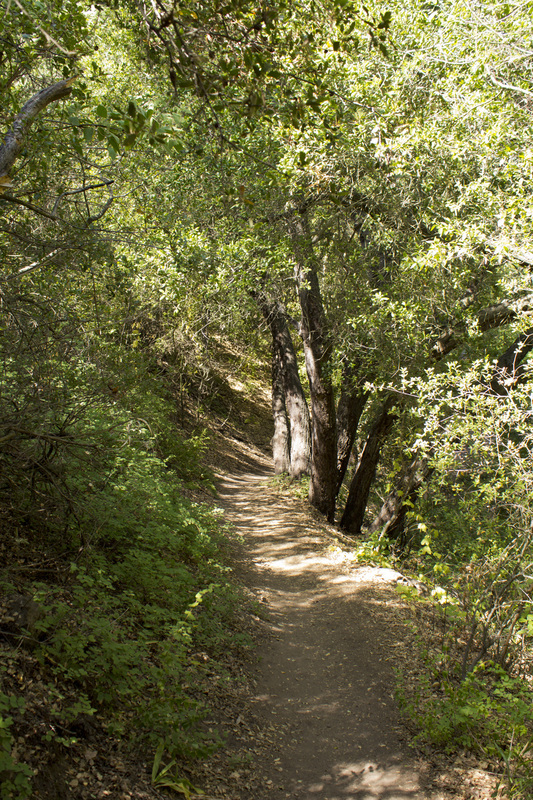 The only truly shady spot on the trail is the area around the Split Rock Picnic Area. 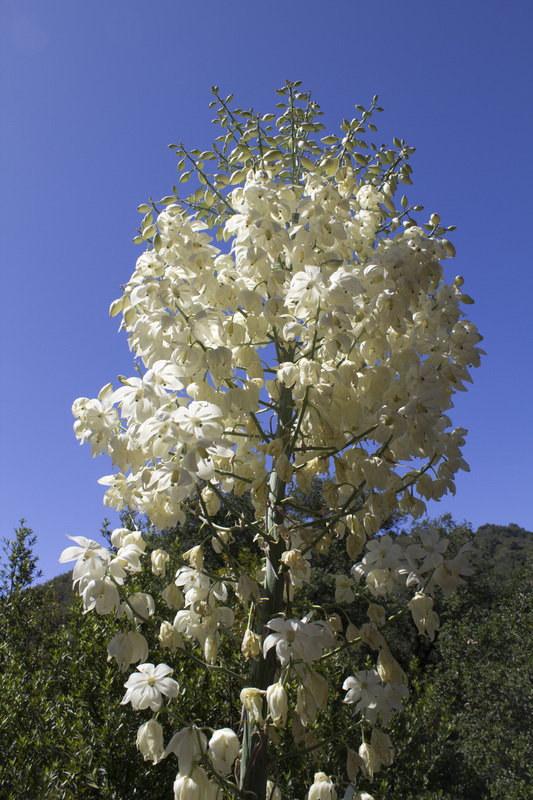 Depending on the time of day, you may find intermittent shade along the eastern and northern sections, but there is no shade from Tri Peaks to the parking area. 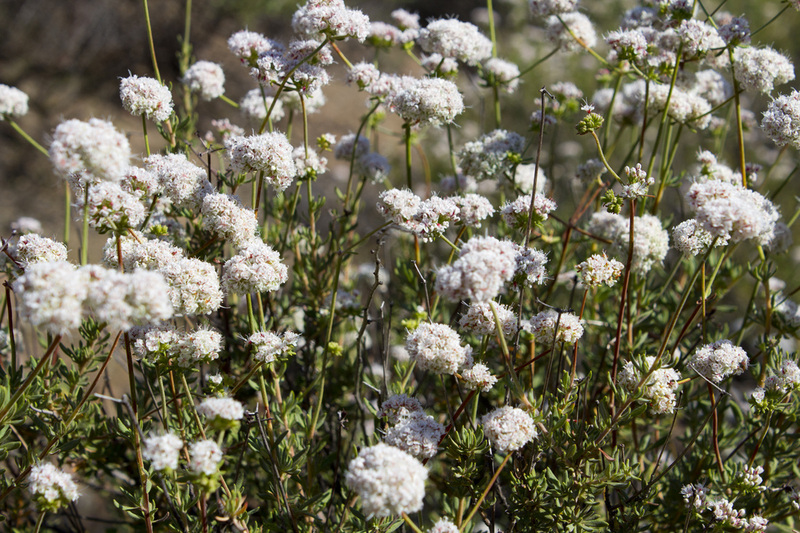 Be sure to take plenty of water as the trail can get hot and the nearest water is a mile down the road at the Circle X Ranch. For those who don't have the time or the energy to do the full loop, Sandstone Peak can be attained on an out-and-back on the Backbone Trail. Simply turn left at the first Trail Junction instead of right. It should be noted that the climb is rather steep and this 1.5 mile section is not as scenic as the rest of the loop trail. 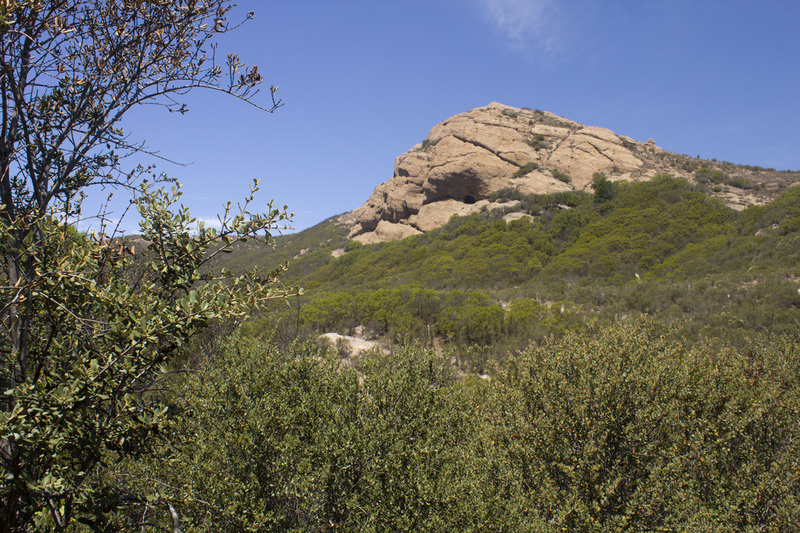 Sandstone Peak is part of the 5 Peaks, the tallest points in each of the 5 surrounding mountain ranges and is a must have summit for peakbaggers. Take the PCH Highway through Malibu. Turn right up Yerba Buena Road (alongside Neptune’s Net Restaurant) and continue for 6.5 miles to a dirt turnout on the left. A sign on the hill for Sandstone Peak marks the turnout. There is a large parking area above Yerba Buena not visible from the roadway. A pit toilet is available at the far end of the parking area, but no water. A water fountain is located at the Circle X Ranch about one mile back down the road. Pull into the dirt turnout about 1 mile past the Circle X Ranch. The turnout is located on the left side of Yerba Buena and leads to a large parking area above the road. A pit toilet is available at the far end of the parking area, but no water. A water fountain is located back at the Circle X Ranch. The trailhead is located at the northern end of the parking lot with a large information sign. Walk uphill about a third of a mile to the first trail junction. 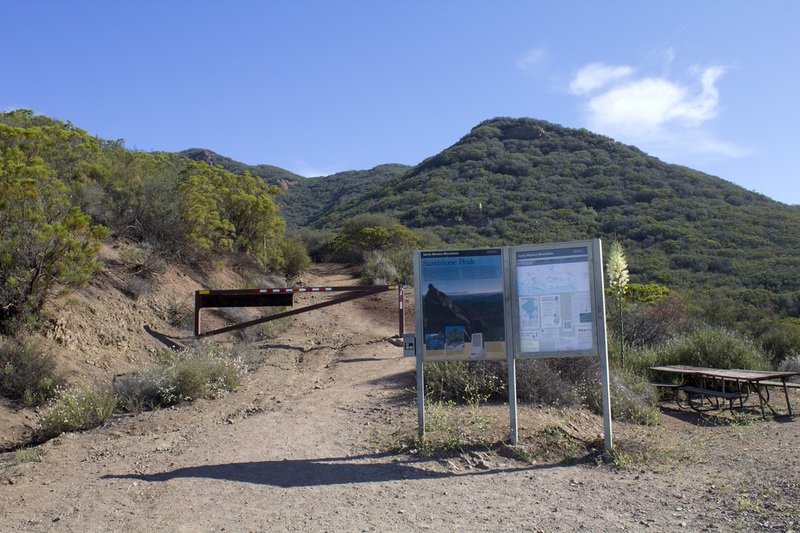 At the juction, follow the Backbone Trail to your right for about .2 mile to reach the Mishe Mokwa Trailhead. 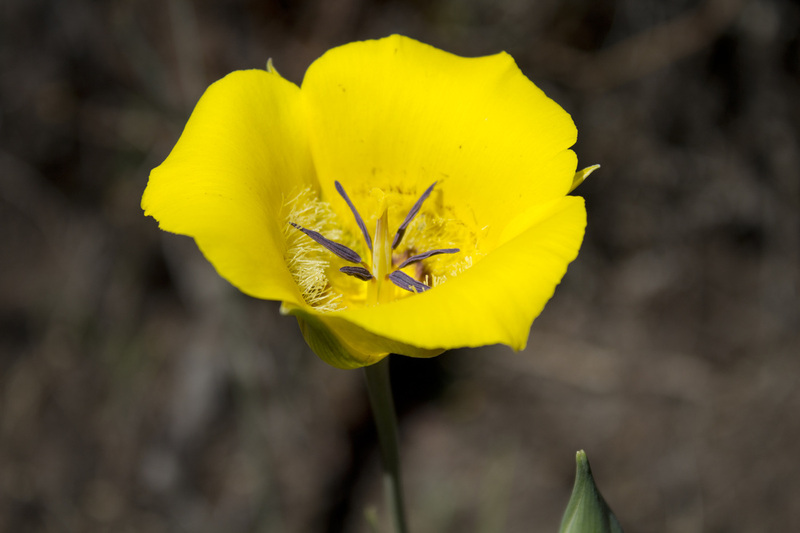 You will be returning from Sandstone Peak on the trail to your left. Continue moving forward onto the Mishe Mokwa Trail toward Split Rock located 1.3 miles ahead. The Backbone Trail will hairpin to your right. 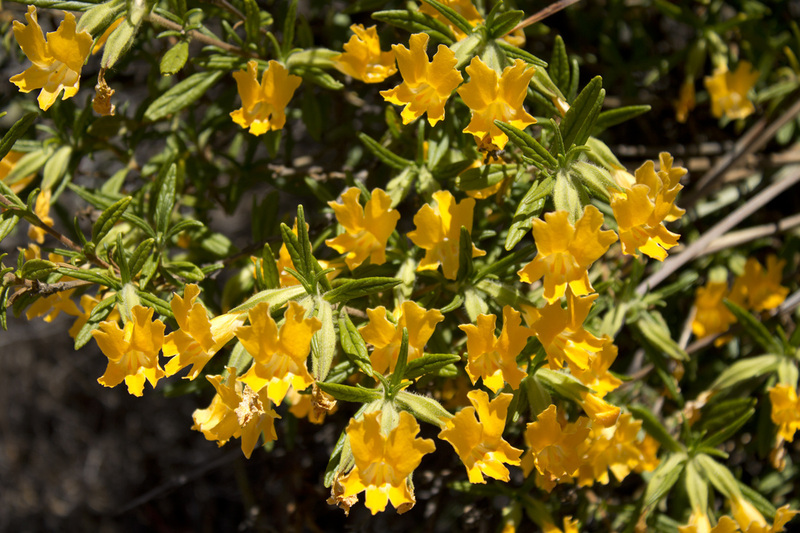 At 1.85 miles you will pass through a riparian landscape and reach the Split Rock Picnic Area. A picnic table with lots of shade and a large boulder split into thirds are a good point to rest. Keep to the left to stay on the Mishe Mokwa Trail for 1.5 miles to reach the Tri Peaks Trail Junction. 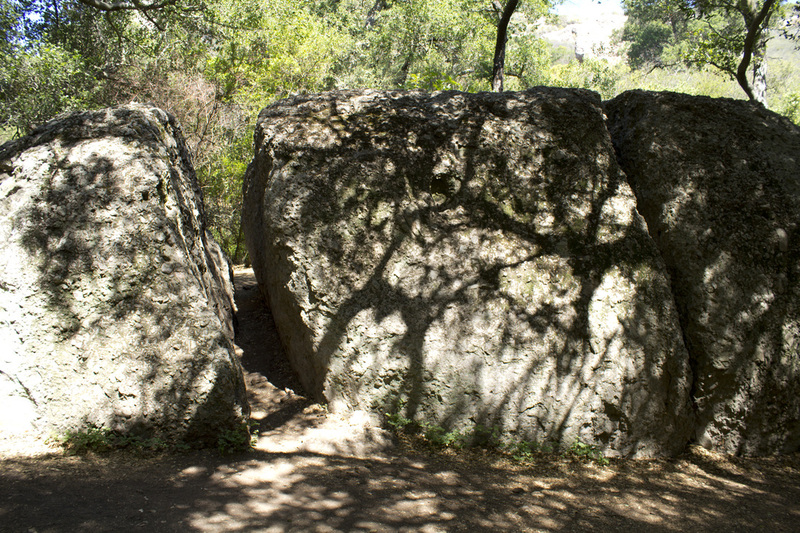 The Balance Rock Trail to the right is not developed nor maintained by the park service, is difficult to maneuver and rattle snakes are prevalent in the underbrush and on rocks. It is not a good trail to hike. 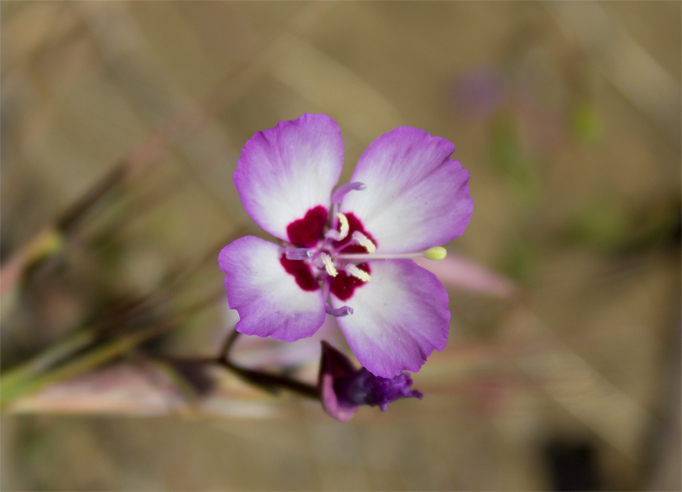 Stay on the Mishe Mokwa Trail! You're right below Tri Peaks and there is broken sign marking the trail branching off to the right, so this must be the trail to Tri Peaks, right? Wrong. The trail dead ends in a gully. Continue on the Mishe Mokwa Trail around a wide sweeping curve for about .25 mile to reach the Tri Peaks Trail Junction. A 3,100' outcropping of sandstone makes for some great bouldering and excellent western views. Fantastic views of the surrounding ranges are to be had at this 2,800' overlook a short distance from the main trail. Sandstone Peak is roughly .9 mile from this point. 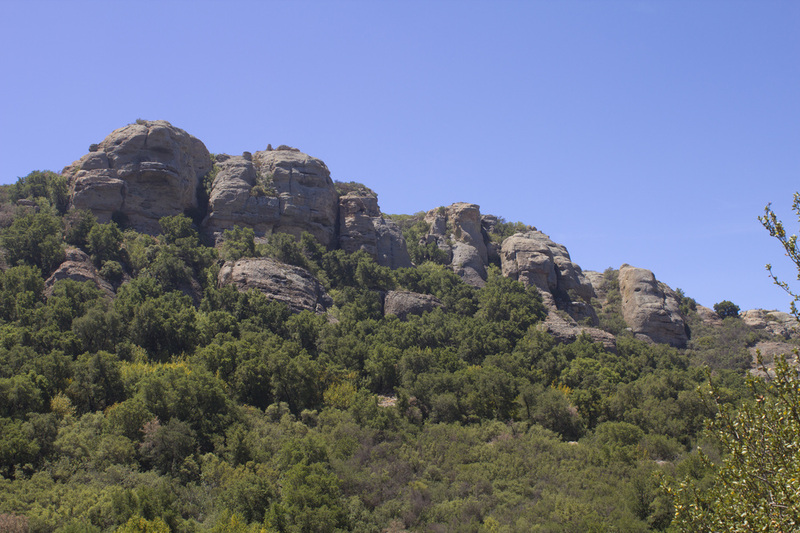 Take the steep steps up this short 1/8th mile spur trail to the summit of Sandstone Peak. When you come down, turn right and continue on the Backbone Trail for 1.5 miles to the trailhead and parking area. 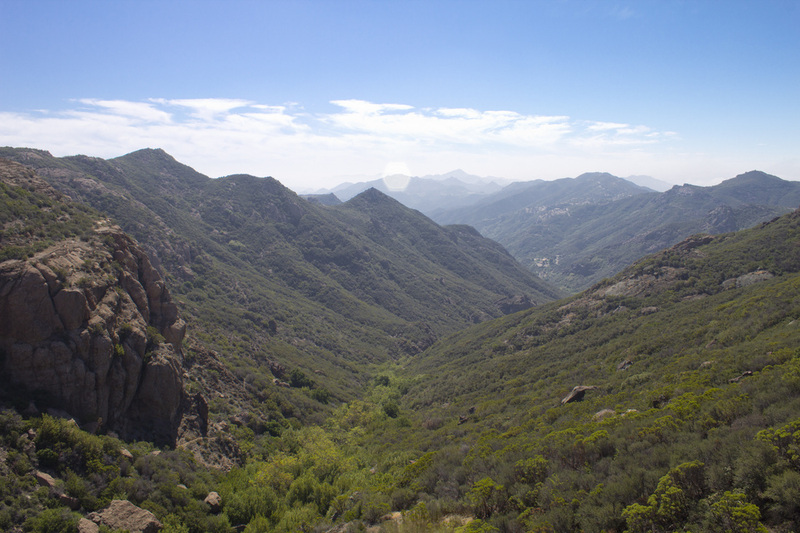 Congratulations, you've bagged the highest peak in the Santa Monica Mountains and one of the 5 Peaks, the tallest points in each of the 5 mountain ranges surrounding Los Angeles. A small monument marks the summit. The Backbone Trail reconnects with the spur trail to the parking lot. Turn right and continue downhill about a third of a mile.